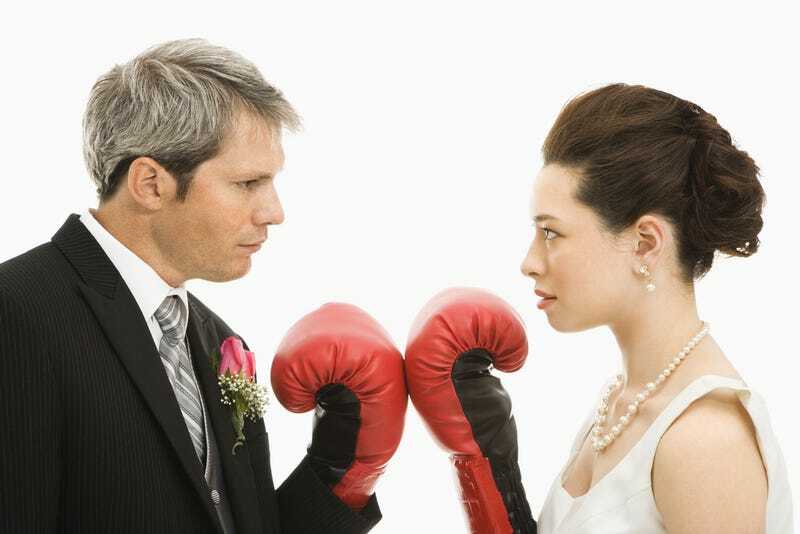 Who Threw Hands at Your Wedding? Welcome to Pop The Question, a weekly space to dissect every aspect of wedding madness. Each Tuesday, we'll ask a question (sometimes there might even be a poll! ), you'll share answers and stories, and then we'll bring you the best of the bunch on Thursdays. You'll laugh, you'll cry, you'll fly into a total rage over something that doesn't actually matter … it will be just like your wedding day. Uncommon Courtesy unearthed this rather troubling wedding tale (hilariously filed under Non-Romantic in r/relationships) on Reddit. One of my [26/F] bridesmaids [26/F] stabbed and nearly killed my husband's [26/M] cousin [30/F] at our wedding. What do we do with the gifts they both gave us, and what do we say to our guests? The fixation on what to do about the gifts the knife fight participants gave the happy couple stuck me—and the gals at Uncommon Courtesy—as odd. Just ...? Keep them? Of course, worrying over what to do about those gifts pales in comparison to the oddity of people engaging in a knife fight at a wedding and provides the perfect basis for this week's PTQ: Tell us about any fights that took place at your wedding! They can be fist fights, or verbal matches, or even, say, a particularly heated duel. Perhaps involving lances? Oh let there be lances! I know at least one of you had to have had a Renaissance wedding. This question also provides the perfect reason to re-share this story, which was featured in the round-up of your best stories about the Marvins who acted a fool at your weddings. I wouldn't say it was 'royally screwed up' but we did have a bit of fisticuffs. Our venue is on a private school's campus. It used to be the convent and is now the library for the school in one part and a reception/wedding venue in another with the nuns living on the 3rd floor. The school isn't so much in a residential area, but there are homes nearby. Ceremony went off without a hitch (as far as I know) and afterwards we went up to the bridal suite to have some snacks & drinks while everyone else was cocktailing or whatever. Apparently one of the homeowners near by had just had ENOUGH of our salsa band. Keep in mind, this was literally 15 minutes into the cocktail hour and the band had been playing MAYBE for 10 of those minutes. He proceeds to come into the venue, try to unplug the all of the musician's equipment and got all loud with the band. The cater's son also works with her as an assistant site manager. So he was there and witnessed it all. He went over to the homeowner, trying to diffuse the situation when the guy swung at him. A fight follows, cops are called, he's escorted out in handcuffs and the cater's son is all bloodied up. Our best man took care of everything, no one knew what happened. He brushed it off as nothing, didn't tell anyone until MUCH later in the evening. My husband leaned over to me in the limo and goes 'did you know John broke up a fight tonight?' UM NO, no I did not! The cater's son pressed charges against the homeowner for assault, as did the venue for trespassing. I have no idea how it all turned out but I have a somewhat fun wedding story! Come Thursday, we'll take our ringside seats and watch as your best stories battle each other for glory.